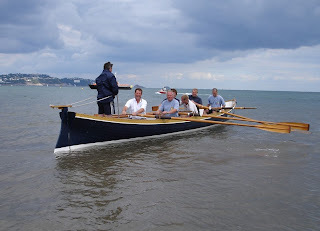 According to this report in the Herald Express down in the West Country, the members of Paignton Rowing Club have got fed up with not being able to go out in their shells when wave heights in Tor Bay exceed about 2in, so they want to get into pilot gig racing. They have got a fibreglass boat for training but need a proper elm leaf boat to qualify for racing. An opportunity has come up to buy Minerva, recently built by RB Boatbuilding in Bristol, but for that they need to raise £20,000. A 'try before you buy' day induced such enthusiasm they raised £4,000 on the spot, but they are still short of seven grand. Judging by the smiles on the faces of these guys in a photo taken from the club website, they are having lotsafun, so if you want to help them out get in contact with the club here. I'm going to look into this. There doesn't seem to be any consensus and as far as I am aware only the Cornish pilot gig has been formalised. Scarborough and Whitby race gigs against each other, all built by David Winspear as mentioned a few posts down.